Thomas W. Schaaf Sr., a retired naval aviator whose aircraft carriers frequently moored in Subic Bay, Philippines, offers a review in the Washington Times of James M. Scott's Rampage: Macarthur, Yamashita, and the Battle of Manila. 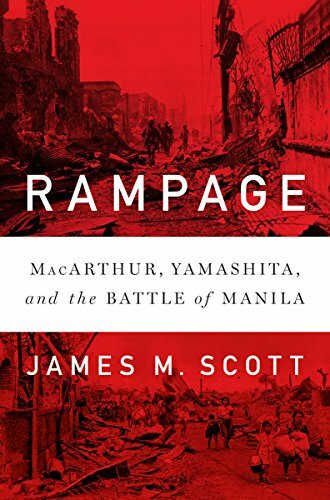 “Rampage” is the story of Gen. Douglas MacArthur’s return to the Philippines after his escape from Corregidor on April 9, 1942, with this family and a small staff aboard four PT boats. Barely one month later Bataan fell followed by the surrender of Corregidor a little more than three weeks later. The rugged Philippine peninsula where thousands of MacArthur’s men had fought and died had become an emotional brand burned deep into the general’s conscience. By mid-1944 the Navy and Marine Corps had battled the Japanese across the central Pacific and some senior naval leaders were advocating bypassing the Philippines and saving American lives by avoiding a costly invasion of the Philippines when the imminent fall of Japan would end their occupation. This proposal had outraged MacArthur and he refused to back down. In a showdown in a beachfront mansion in Hawaii where the Joint Chiefs and the president were meeting, MacArthur fought to bend American strategy in his favor going so far as to threaten Roosevelt. Before World War II, Manila was known as the “Pearl of the Orient.” In the chapters leading to the deadly and destructive Battle of Manila in February 1945, Mr. Scott describes how our policymakers after the Spanish American War (1898) realized Manila would need a face-lift if it were to be the front door to the markets of China, India and Malaya. Manila had blossomed into a 14-square-mile modern city, one whose population had tripled to 623,000 residents by the eve of the war in the Pacific.